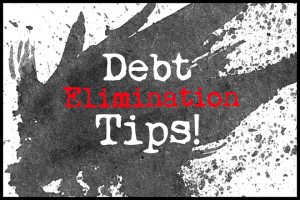 Welcome to Debt Elimination Tips – a regular series here on Disease Called Debt where I share my favourite debt busting tips with you to help you pay off your debt faster. This week’s tip is about how keeping your eyes on the prize will help you clear your debt faster than you’d think. Let’s not sugarcoat it – doing what it takes to pay off debt month after month is hard – and tedious. There will be challenges in the way of unforeseen expenditure like when your car breaks down or when you accidentally go over your calls allowance on your mobile phone bill. You’ll be asked to take part in social gatherings which you feel you can’t turn down – and quite frankly you won’t want to turn down. There may be major celebration events coming up like a wedding or special birthday do for someone special in your life. It’s easy to skip a month or two of extra debt repayments when these things happen. But the problem is that by doing that, you’re only delaying the amount of time you’re in debt for. If you’re serious about paying off debt, you need to be making overpayments month after month – even weekly, despite the unforeseen expenditure and despite the nice things you want to do or social events you want to be a part of. Life is short and many people will use that as an excuse to put off repaying their debt. However, if you want to get out of debt, then actually doing that must become your main priority. The prize of becoming debt free will totally be worth every sacrifice you make now – and that includes saying no to your friends when they ask you go out to dinner and even turning down invitations to certain special events. I know that it’s not possible to decline every invitation and you’ll probably go crazy if you were to do that anyway – but the bottom line is that whilst you’re spending money on things other than your debt, you’ll be keeping your prize of debt freedom at arm’s length. So, prioritising is a must when you’re paying off debt. Attend the social gatherings that you really want to by all means, but make sure your debt is being dealt with first. Don’t skip a month or two. Find a way to raise money to pay for whatever it is your spending your money on by earning extra income. Make your spending a conscious decision and compensate for it in advance. As for unforeseen expenditure, there is a really easy way to avoid that getting in the way of your debt repayment. Getting an emergency fund set up to deal with the odd higher than expect bill or financial emergency is critical to the success of your debt repayment. Start by putting as much as you can afford into a separate bank account and then continue to top it up each month by setting up a direct debit. Debt expert Dave Ramsey says to put away around £600 ($1000) for emergencies before starting to repay your debts. Personally, our emergency fund started at £500 and then we made monthly payments into it of just £30, allowing us to concentrate on repaying our debts whilst also being able to pay any unexpected bills. Always keep your eyes on the prize – debt freedom – every month that you pay off your debt. Don’t allow instant gratification or unforeseen expenditure to cloud your judgement over whether to skip a month or two of debt overpayments. Even if you overpay something, you’ll be taking steps to cut down your debt faster. And if you do consciously decide to spend money on something that you want to buy or want to do, then you could compensate for your planned spending by raising some cash to pay for it. 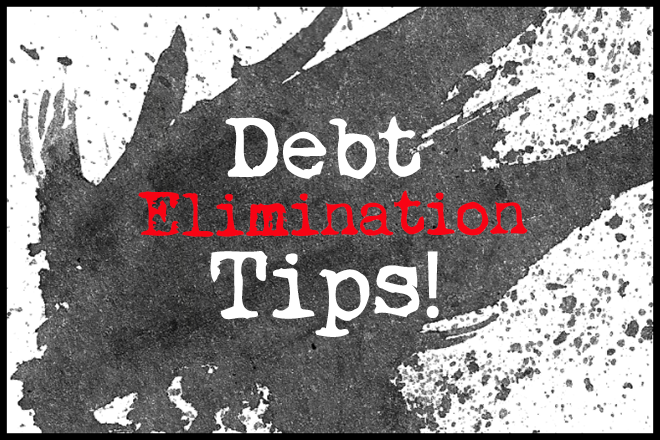 I hope you enjoyed this week’s debt elimination tip! Make sure you don’t miss out on any more tips by subscribing below. It’s the same as “looking at the big picture”. I believe when you are holding on to a promise, you tend to stick to it and guide you through towards your goal. It does help you reach your goal because you are always reminded that you have a goal to attain. I agree with Jayson if you focus on what you want your future to be, it will be easier to stay the course. This year I took 5 steps forward and 4 steps back due to financial crises that were out of my control. Thinking about how my life will be for me and my daughter after debt leaves my life for good, keeps me motivated and I refuse to give up. Also your right……debt is a disease. Even though mine isn’t so much about debt as it is low income, it’s still tough to say no to friends, especially when it involves a charity they are trying to raise money for or something like that. But at the same time it’s the whole oxygen mask thing…you have to take care of yourself first. That’s really the key struggle, isn’t it: achieving financial goals vs. social obligations/living life. I’ve found that your ability to temporarily say “no” to the latter is the key to the success in the former. Yes definitely DB40. It’s also about being in control over your own future and realising that what you do now will have an impact. That is some good advice there. One of the reasons I am starting over again is because of losing focus, not just on repaying debt but on writing about it as well. You couldn’t have picked a better time to post this! How are you enjoying your debt freedom? I’m glad this helped you Rob! Having focus really does help so much. I’m looking forward to reading more about your debt repayment over at Debt Spot! And thank you debt freedom so far has been pretty great. The best thing is having that peace of mind that we’re not going to be chased for payment and that our money is now ours to do what we want with (basically to save it!). This is like finding your why and then working hard to achieve it. Loving this series! Saying no to friends is definitely one of the hardest parts about debt repayment. But I can’t wait until it’s all gone and I can finally start saying “yes” more!